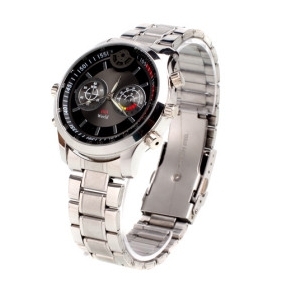 HD Video Recording: This spy watch records videos in AVI format at 1280 x 720 and 30fps. Waterproof: This cool spy gadget wrist watch can handle being up to 3 meter underwater. 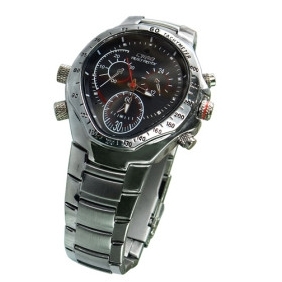 The face of this Spy Wrist Watch is made with metal and glass, ensuring reliability and durability, even when being used underwater. 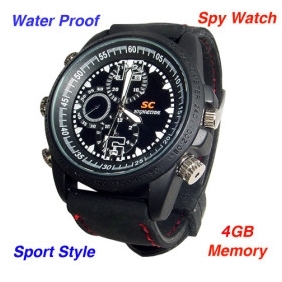 4GB Memory on-board memory: You get 4GB storage space already built into this awesome spy watch. In addition, you can also increase your storage space with the use of a TF Card. Simply insert your TF Card (Maximum up to 32GB TF Card supported), and you will instantly have more storage space for your recordings. 72 Degrees Lens Coverage: In order to ensure you get a maximum viewing angle whilst recording. 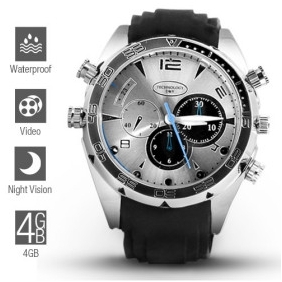 This waterproof spy watch comes with a lens that can film anything within a 72 degree range. 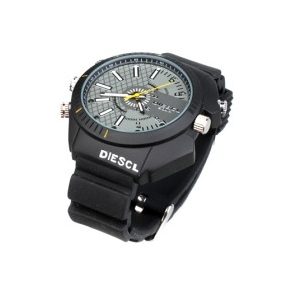 Still Images: You can also capture still images with this spy watch. Still images are captures in JPEG format at 1600 x 1200 resolutions, which allows for easy viewing on any computer. Audio Recording: In addition to Videos and Still images, you can also record Audio in WAV format that can instantly play back on your PC using a number of media playback software’s such as windows media player, VLC player, etc. 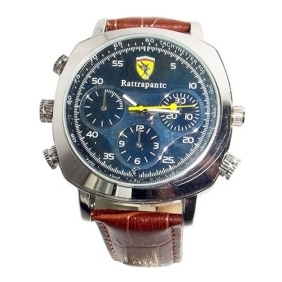 Time & Date Stamp: When recording videos or taking photos, this Spy Watch included a Time & Date Stamp on the footage. This awesome Spy DVR is suitable for both professional and amateur recording.